Niclas Castello takes on Chanel. 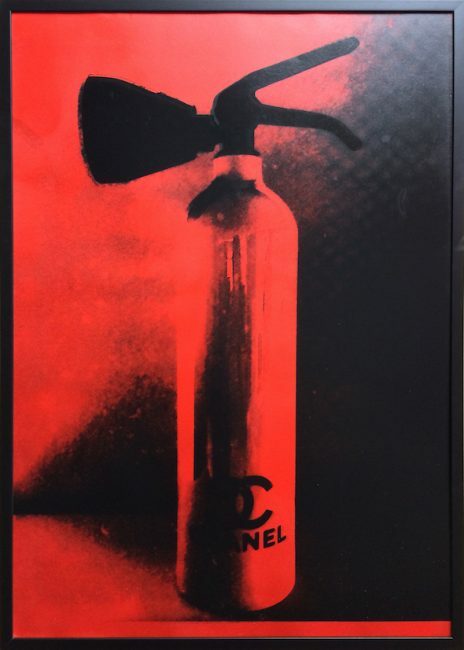 These limited edition Chanel Fire Extinguisher prints come in 6 colors. Niclas Castello grew up in the former eastern part of Germany. After the fall of the Berlin Wall in 1989, he was opened up to a world of color that he became fascinated by. He moved to Paris and found inspiration to paint in the famous Montmarte district.Inspired by the talent of his mother and the legendary Paris fashion shows, he found his way to art and created his first paintings. In 2002 he returned to Germany and studied art at a private university.dissatisfied with the way art was taught in school. He dropped out and considered quitting art altogether.Because Castello was bored with the way of teaching, he broke up without degree Led by his instinct, in 2004 Niclas Castello decided to live in New York City. By accident he found shelter by the performance art pioneer Arleen Schloss,where he lived. Thankfully, he was led by instinct to New York City. He found solace in the mentoring support of Schloss and the inspiration of New York City. Castello´s new style was born. Driven by that passionate inspiration, further renowned sculptures and paintings were produced. Niclas Castello sculptures are recognized worldwide for their playful nature and extravagant look. Castello takes the mundane and turns it into fabulous art.He is also well know for his luxe fire extinguishers. Castello takes old fir extinguishers, empties them, and then makes them into collectors items by imprinting famous logos on them.